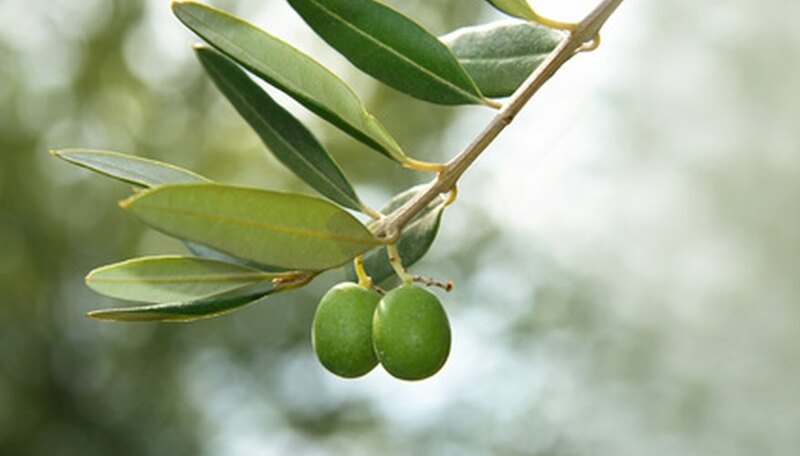 The olive genus, known botanically as Olea, is a fruit or drupe producing tree grown widely in warm and temperate climes as an edible as well as an ornamental plant. According to Paul Vossen at the University of California Davis, fertilizing olive trees is a tertiary concern after watering and weeding, as the various species do not pull significant nutrients from the surrounding soil and over-fertilizing is a much more common peril than under-feeding. Choose a nitrogen-rich organic fertilizer that will feed the olive trees gently over time. Look for a fertilizer product containing feather meal and/or blood meal or use a good quality compost instead. Consult the label of the product to determine the amount of actual nitrogen it contains as this will determine how much you will need to apply. Apply 20 to 25 pounds of actual nitrogen for every 1/2 acre of olive tree plantings, each year, in one or more applications. Feed olive trees that only receive natural rain fall once in the early to mid-winter before the rainy season commences. Feed irrigated trees several times a year from early spring through fall. Hand cast the proper amount of fertilizer under the trees starting a few inches out from the trunk and extending at least a foot past the outer drip line of the olive canopy. Gently spread the fertilizer with a rake and nestle the grains in the top inch of soil. Water in well to drench the soil at least 6 inches down if growing the trees in an irrigated area. Allow forthcoming rain to settle the fertilizer if growing the olives in a dry, natural orchard setting.